If ever there is a desire to remember God or longing for godly act or yearning for Japa, Meditation and Satsang; know that it is due to GURUKRUPA ONLY – So says Sadguru Swami Sivanandaji Maharaj. July 2, 2004 Guru Purnima (Ashadi Purnima) was celebrated with great enthusiasm and devotion at the Ashram. The satsang began with recitation of Sri Jai Ganesh prayers, Sivananda Panchkam , Guru Strotras. About four hundred devotees participated in this holy occasion. Gurudeav’s Paduka Pujan was performed. The satsang was concluded with serving prasad (lunch) to all. 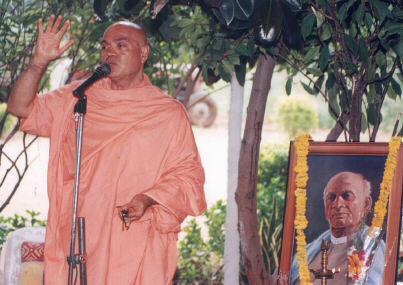 41st Maha Samadhi day of Brahmaline Guru Bhagavan Srimat Swami Sivanandaji Maharaj was observed in the same manner on July10, 2004 with Paduka Pujan and Satsang. At Srinagar (J and K): Ten days Yogasana camp was organized for the Soldiers, Army officers and their families of Northern Command Wing. Yoga instructors Sri. Atul Parikh and Ms. Sangeeta Thawani from the ashram accompanied Pujya Swami Adhyatmanandaji and conducted yoga classes for them. Rev.Swamiji spoke on the subject of stress management through Yoga, Pranayam and Meditation. General Shri Choparaji attended all the sessions and was very much inspired by Swamiji presence. On July 2, holy Guru Purnima day, Guru poojan was observed at flagstaff house of General Saheb. Here tree plantation of Chinar trees by Swamiji were done. At the conclusion ceremony, Swamiji’s inspiring address to Army officers and soldiers was very will received by all. This entire yoga program at Shrinagar was an enthusiastic and dedicated work of Colonel A, Shri Suhas Vishnu Dharamadhikari. At Northern Command Wing - "Subhash auditorium"
On July 10, 2004 at grand concluding a session Dhyana, Pranayama, Trataka were performed by all. At the end of the function the General Commander of the Army extended his sincere gratitude to Pujya Swamiji Maharaj. At Sonmarg (J and K): On July 12, 2004 Pujya Swami Adhyatmanandaji along with his Yogasana team reached at Sonmarg. Satsang was arranged and Swamiji spoke to Soldiers. He emphasized the importance of daily prayers and faith in God to overcome every day tension in life. Pujya Swamiji led a heart touching kirtan, which moved all present. All felt blessed by His holy presence. Swamiji and his team went out for little sight seeing on the way and visited Maa Kashmir Bhawani temple and Sri. Shankaracjharya Shrine. On the July 13, 2004 Pujya Swamiji Maharaj and the team started to Baltal for their onward journey to Shri Amarnath shrine. The devotees joined Swamiji in offering flowers, bilwa leaves and worship in the shrine. 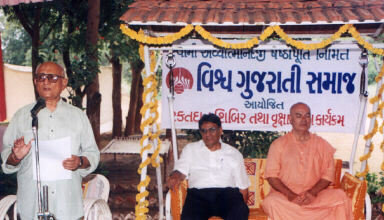 On July 17 2004, Vishwa Gurjarati Samaj organized a tree plantation project and Blood Donation camp at Sardargram near Koba, Gandhinagar. One thousand trees were planted. This is among the many planned activities of Pujya Swami Adhyatmanandaji’s Diamond Jubilee celebration.. Annual Meeting of Trustees of Sivananda Ashram, A’bad and Gujarat Divya Jivan Sangh. On July 19, 2004 one day seminar, “Inter college Sanskrit Natya Seminar” was organized at the Ashram. Pujya Swamiji Maharaj lit the lamp and inaugurated the function. On this occasion Many Sanskrit Scholars Maha Mahopadhyay Dr. Tapasvi Nandi, Shri Chandra Bhushan Pandey (Akhil Bharatiya Sanghathan Mantri), Principal Shri T. J. Purani of L & C Arts College, professor Shri B. S. Trivedi, Head of the Sanskrit faculty, Shri Vasantbhai Bhatt, Dr. Geetaben, Dr. Suhasben Jhala and many more scholars of Sanskrit were present in the function. A play in Sanskrit named, “Mruch Katik”, Swapna vasavdata”, Malvigni Mitra”, were presented by the students. It was very interesting. Even more interesting was that Pujya Swamiji’s address to the students was in Sanskrit too. Eighty participants took part in this one-day seminar from different colleges from Ahmedabad. Students participated in a open discussion about Sanskrit as a language in daily use and how it would affect civilization and culture. 550 to 600 kg. of grains are distributed to needy families through Vishwanath Seva Kendra this month. Rev. Smt. Rupaben Majmudar and Shri Tapan Mankodi conducted three Reiki seminars this month. Fifty-four participants attended the course. During the month of Adhik Shravan, Sri Vishwanath Mahadev Mandir at the ashram was crowded with devotees for special worship offering of bilva patra archana and abhishekam. To cope up with increasing demand, in addition to regular four Yogasana classes, there is an addition of one more session for beginners Yoga students. Ms. Pinki Choxi and Dhawal Patel are the instructors for this class. On July 18, 2004 Swamiji was invited to inaugurate “Swaranakshaya” NutanYoga Bhavan of Shri Prakashbhai Soni and Smt. Bhartiben Soni on 10th anniversary of Yoga Classes run by them. Two hundred “Borsali “ plants were distributed in Prasad to all present. Lions club, Sanand organized Rev. Swamiji’s public Satsang and discourse on July 18, from 6.30pm to 8.00 pm. A devotee group of Tamil Sangh gathers at Sri Sri Sri Ashta Lakshmi Bhavan for Sri. Lalita Sahasranam path on last Friday of the month. This month Smt. Jankiben Shah took yoga classes for the beginners. There were seventy eighty participant enrolled in this new batch. Regular sewing classes run for ladies at the Ashram. All the ladies scored first class in the exam conducted by State government this time. At Jaipur, Rev. 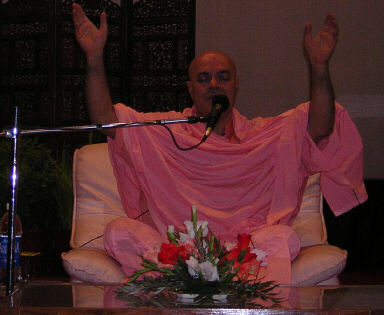 Swamiji was given a warm welcome in early hours of dawn on July 22, 2004 . Full day activities were planned at “Ammattas Green “ from 7.30 am to10.00 pm at night, when Swamiji had his evening bhiksha. 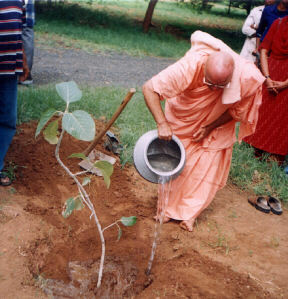 It began with tree plantation of twenty-five hundred trees by devotees and Swamiji joined them for a few. A public meeting at 10.00am was organized at accountant general office. Devotees in large numbered gave a cordial reception to Pujya Swamiji Maharaj. The enthusiasm and overwhelming joy of devotees were visible. The dais was decorated with rangoli and flowers. Pujya Swamiji was received with Panchkarn poojan- archan, Mangalvadiya and Vedmantra recitation along with Sankhnadand and Arati. Principal Accountant General, Shree Bhavesh Ranjan Mandal Saheb, (a Yoga Prachar Ratna), the present President of Rajasthan Swasthiya Raksha Parishad, the former President and great number of devotee’s of Divya Jivan Sangh, Jaipur were present. Shree Mandal Saheb teaches Yogasana to all at any and every opportunity he gets including in his office at lunch hours. He is rightly awarded “Yoga Prachar Ratna”. There was a demonstration of Yogasana also. Swamiji Maharaj addressed the gathering and emphasized “a Yoga way of Life” for happy and healthy living. Another lecture was arranged for senior officers on the subject of “Yoga for inter personal relations” with question-answer session at 3:30 pm. Press conference with media people from 4:30pm to 5:30pm was held. In the evening a discourse on the subject of “ Japa Yoga “ by Swamiji was attended by large numbers of devotees at “Ram Lila” ground of Amaltaas. Extensive coverage was given to the full day events in Jaipur by newspaper and TV media including Doordarshan, Zee TV, Sony, Aastha channel and Sanskar channel. Last event of the day was home satsang and bhiksha at Shree Suresh Aggrawalji’s home. Swamiji had his bhiksha( Dinner )at 10.00pm and he, then proceeded to go to Delhi by train at 11.00pm reaching Delhi at 4.00am. Rev. Swamiji attended satsang at Noida (Gautam Budh Nagar ) and Vasant Vihar. He was invited for inauguration of Yoga Mahaparishad Yoga conference) organized by Bharatiya Vikas Sanstha at Janakpuri. Early morning on July 24 2004, one hundred sixteen devotees with Swamiji Maharaj began their onward journey to holy Kailash Mansarovar. Devotees prayed and wished them safe journey.